Unlike other martial arts, in Jiu Jitsu the emphasis is not on punching and kicking. Instead, students are taught how to apply leverage to weak parts of their opponent’s body. Jiu Jitsu enables anyone, regardless of their size, to effectively defend themselves against larger or stronger opponents. It’s a fact that in 90% of self-defense situations you will be forced to wrestle or grapple with your attacker. To defend yourself you need to learn the most effective grappling techniques in the world. Learn the most important concepts and positions in Jiu Jitsu and develop a solid foundation for your future. The techniques focus on leverage and body position. Learn attack and defense techniques for every situation. This program encompasses all aspects of martial arts and will enable you to build your own Jiu Jitsu style and game. Expand your knowledge of key concepts and positions from Fundamentals while you build your strength, balance, and coordination. A critical and formative learning period in your Jiu Jitsu journey. This ancient form of self-defense is a great way to learn about grappling without wearing the traditional uniform. No-Gi is a complement to traditional Jiu Jitsu as it helps develop quick movements and transitions, as well as the ability to quickly submit your opponent. Muay Thai is known for its tremendous striking power and effectiveness. It utilizes all the key weapons available to the human body - knees, elbows, feet and hands. For this reason it is often referred to as the “Art of Eight Limbs”. Because Muay Thai is so effective, it is practiced all around the world and is commonly used as the striking base in mixed martial arts. Muay Thai training builds fitness! Practicing this martial art will help you develop not only enhanced cardiovascular health, but also amazing anaerobic endurance from exercises like punching and kicking. Regular training in Muay Thai delivers improved strength, flexibility, coordination, and physical performance. In our Fundamental Program students learn stand-up striking and Thai clinching techniques in a safe and secure setting. The program is taught utilizing a systemized curriculum which helps students progress rapidly. 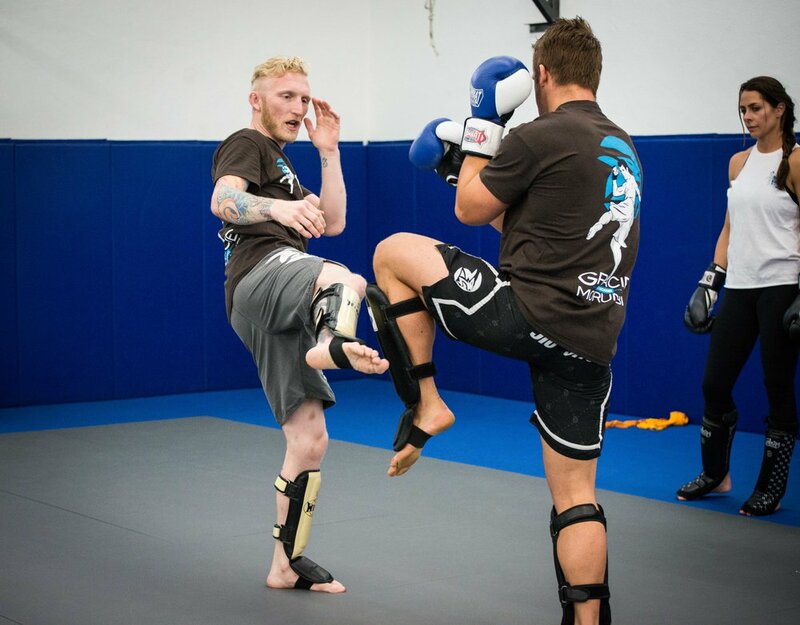 Advanced classes focus on combinations, bag work, controlled full equipment sparring, and the application of distance and timing. These classes are great for students with more experience in martial arts, or for those students who have learned the fundamentals and are ready for the next level.